I’ve never actually seen the movie Fight Club. 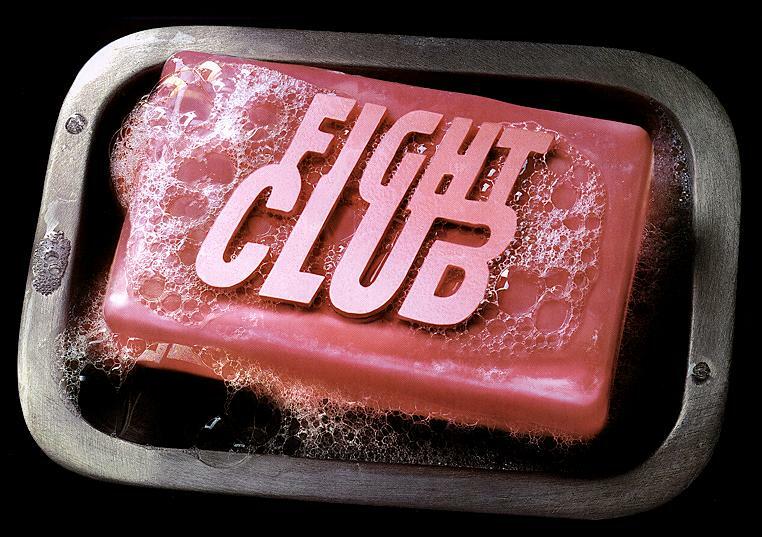 All that I really know about the film is that it stars Brad Pitt and Edward Norton, features people fighting, and, as the picture above would indicate, somehow soap is involved. But it’s the first movie that comes to mind when I think of the most inaccurately named publication I’ve ever come across, Philadelphia Magazine. You see, every year Philadelphia Magazine does something that the student newspaper from my alma mater Temple University, the Temple News, used to do every year like clockwork: piss off the Black community. Based on this particular story, there’s an irony connected to Temple that I’ll get into a little later. But the Fight Club analogy is employed when it comes to Philly Mag’s relationship, or more accurately lack of relationship, with most of the people who live in the city for which it is named….you know, people of color. This was the magazine’s cover story. 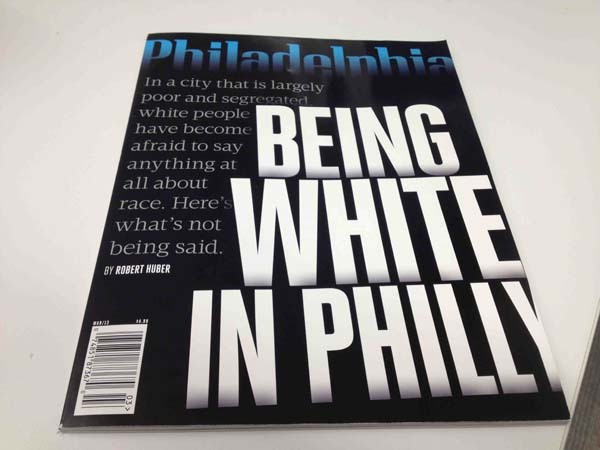 When “Being White in Philly“ hit the newsstands, it became the latest confirmation of Philadelphia Magazine own special thing it calls Let’s Piss off the Black Folks Fight Club. Now the first rule of this fight club, like the first rule of Fight Club, is that you don’t talk about it…But where Philadelphia Magazine’s Let’s Piss Off All The Black Folks Fight Club is different is that it allows you to talk about it on a television show, radio program, or anywhere else you go to try and explain away some boneheaded thing you’ve done. And make no mistake, this was a boneheaded article. And the reason why he thinks that nothing’s been done about this is because white folks are afraid to tell black folks that they’re a mess and need to get their act together. This lack of “honesty” with black folks on the part of whites is borne of the supposition that race as an issue is only looked at from a so-called “black paradigm” and that while it is also an issue for whites, whites are never asked for their feelings on it…something that Huber goes on to rectify by going to the city’s gentrifying Fairmount section and asking white folks there about their views on race. From Anna, the law student from Russia who believes that all black men do is smoke pot, make babies and comment on her looks to John, who liked his neighborhood until the blacks moved in from the South with “chips on their shoulders”, to Jen, who’s trying to get her neighbors to try the local public school for their kids and Ben, who stood up to drug dealers to stay on his block, just about all of the possible stereotypes are covered. And presented in a way that guarantees a donnybrook. And let’s be honest here. Philadelphia Magazine may say it’s interested in a conversation about race, but what it really wants is a fight. I say this because of this inaccurately named magazine’s track record. Every year, Philadelphia Magazine publishes at least one story that lands it on the Facebook pages of black folks all over the city. People read the story and get mad. They have meetings and hold events to try and calm everyone down. In this case, a group of activists from Rising Sons, the Knight Foundation’s Black Male Engagement project, and others are holding an event in LOVE Park at 4 p.m. on March 20 to show that not all black folks are wantonly procreating while simultaneously smoking weed. Civil rights activists like Michael Coard, who writes for the magazine’s blog The Philly Post go H.A.M. (short for Hard As A, well, you know the rest…) on the magazine about the story. And Philadelphia Magazine laughs all the way to the bank with the money it’s made from all those page views on its website. Now a big part of the problem here is that the last staffer of color Philadelphia Magazine had was former University of Pennsylvania professor (and current MSNBC commentator) Michael Eric Dyson….a bit of stunt casting that went away as soon as Dyson went to Georgetown University. Toward finding a way to change that and having a real dialogue instead of a monologue that masquerades as one, PABJ has invited Philadelphia Magazine editor Tom McGrath and Huber to a special meeting on March 19 to hear the group’s concerns on that score. But I’m not optimistic. Do you know how many times Philadelphia Magazine has probably patted organizations representing journalists of color on the head over this issue? And let’s be totally honest here: both McGrath and Huber have already said that they stand behind this story and all of the stereotypes within it. What I would actually like to see people of color do when it comes to Philadelphia Magazine is start a serious “Ignoring Your Dumb Behinds” program. Now what do I mean by that? I mean that I pretend that your grotesquely misnamed publication doesn’t exist. Since I don’t read your magazine, boycotting you isn’t a solution…but boycotting your advertisers is. I’d send letters to your advertisers saying that if you want another dime of my money, you’ll stop putting ads in this bird cage liner with the glossy pages. But let me get back to the Temple News aspect of this. I found it kind of ironic that Huber is afraid of his white, middle-class son going to Temple because this is the kind of student that Temple has been trying to attract…almost to the point where students in the neighborhoods around the school need not apply. Back when I worked for my alma mater’s Office of News Communications, I found myself saying more than once to my colleagues that if you don’t change the perception on the part of their white, suburban parents, it’s not going to matter. Temple is still going to be seen as this unsafe place surrounded by hostile blacks who want nothing more than to steal and beat up your kids. Thank you, Mr. Huber, for making this argument better than I ever could. Too bad it’ll lead to more kids missing out on a really quality education.